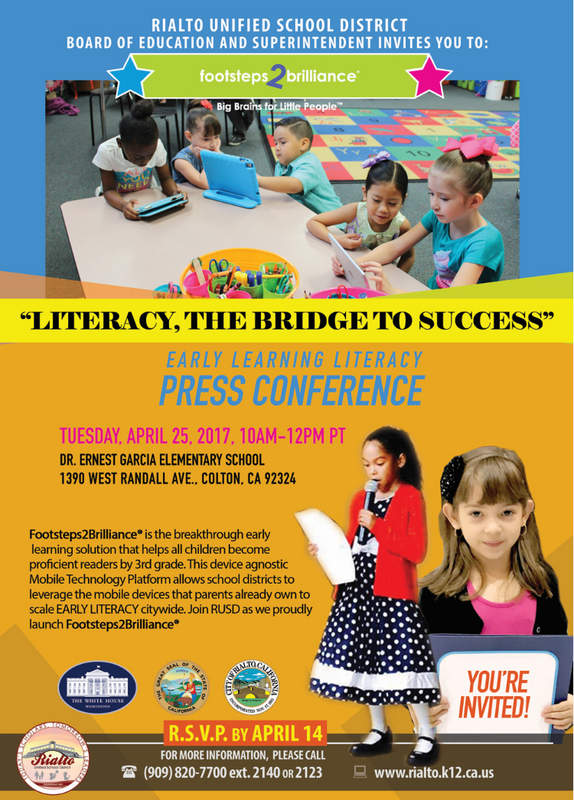 Footsteps2Brilliance® is a transformative pre-K through 3rd grade literacy solution that utilizes mobile technology to connect school, home, and the community for academic success. Its innovative Mobile Technology Platform allows comprehensive literacy apps to be accessed online or offline from any mobile device (Apple or Android) or traditional computer. This enables school districts, for the first time ever, to leverage the mobile devices that parents already own to create Model Innovation Cities. The Footsteps2Brilliance® Model Innovation City™ license creates a turnkey, citywide literacy solution. It allows school districts and the cities that they support to cost effectively scale award winning pre-K through 3rd grade literacy curriculum to every family within their jurisdiction, without spending additional monies on hardware, infrastructure, or maintenance. It also empowers parents with the tools they need to be able to share responsibility for their children’s academic success.